“This is not really a book. “This is a building in the shape of a book…a maze. 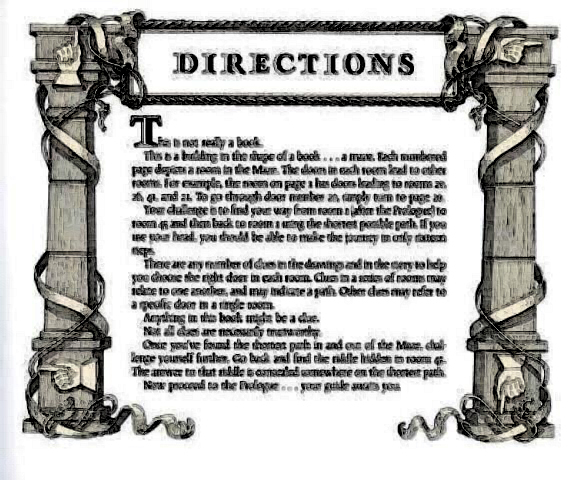 Each numbered page depicts a room in the Maze. The doors in each room lead to other rooms. For example, the room on page 1 has doors leading to rooms 20, 26, 41, and 21. To go through door number 20, simply turn to page 20. “Your challenge is to find your way from room 1 (after the Prologue) to room 45 and then back to room 1 using the shortest possible path. If you use your head, you should be able to make the journey in only sixteen steps. “There are any number of clues in the drawings and in the story to help you choose the right door in each room. Clues in a series of rooms may relate to each one another, and may indicate a path. Other clues may refer to a specific door in a single room. “Anything in this book might be a clue. “Not all clues are necessarily trustworthy. “Once you’ve found the shortest path in and out of the Maze, challenge yourself further. Go back and find the riddle hidden in room 45. The answer to that riddle is concealed somewhere on the shortest path. are you proposing an abs-truce? As I started looking up mathematical signs, while studying the page entitled “DIRECTIONS”, I came across a pointing hand symbol called a “manicula” or “little hand”. It led me to an article called “Helping Hands On The Medieval Page”. Found out that they’re meant to highlight an important “passage”. These hands function as a kind of fingerprint of a particular reader, allowing us to assess what he or she found important about a book or a collection of books. And it appears that right hands are more common than left ones. There were other, easier ways to mark important passages, such as “lines” and crosses placed in the margin. However, in some cases readers preferred to have a more pronounced “signpost”. While a tiny line could be overlooked, the hands – particularly if executed with color – really pulled your attention to the thing that mattered. A medieval book was made because an individual wanted to read and own the text contained on its pages. However, owning a book in the age before print was a luxury. Due to the long production time and the materials used, the cost of a book’s production was steep, even if it contained no decoration or “miniatures”. This is why up to the later Middle Ages book ownership was generally confined to affluent environments, such as religious “houses” and courts. In regards to the “16 steps” I’ve come across something about weaving tapestries with yarn and wool among other things. I’ve also been reading about Christine de Pizan and Susan Groag Bell. Just discovered this site. While it’s not much of a contribution, there’s an old belief that the left hand is the hand of the devil- which is the hand that points you in the direction of the maze on this page. I love this website, I’m so excited to get started on MAZE! Thanks to anyone who keeps this website going, I’m glad to see that it is still active. Forgive me for not reading everything thoroughly, I hope this question isn’t answered somewhere obvious, but is this the best way to go through the book for the first time, in other words, without spoilers and with all the pages and everything? Or is this more for people who have already gone through it for the most part? Thank you for the kind comment about the website! MAZE is not kidding about being the “world’s most difficult puzzle.” It is crazy hard and 31 years after it’s publication we are still trying to figure out what it all means. First, don’t read the possible solutions here or elsewhere. Once you read a solution it is hard to get it out of your mind to make a discovery which is original. Second, map the rooms. This is mind boggling but really fun. Third, focus on one room at a time. If you don’t know how to even get started read the solutions for Room 1, this should give you the idea of how the book works. Fourth, once you believe you have throughly solved a room come back and read the solutions other people have offered for that room. Then post anything you have that is original, even if it disagrees with what is posted. What do we know? Your solution could be better. Just found the site, love this book. Wanted to add that the ‘odd gauntlet’ might be a symbol for the idiom: “the left hand doesn’t know what the right hand is doing.” That could further imply that the ‘right hand’ or ‘right hand man’ – the guide – is not to be trusted. I just looked up that expression. It’s a bible verse Mathew 6:3, and it basically states that when you donate or are charitable, don’t look for public praise in doing so. Keep it to yourself. hmm..
We all love it too! Welcome to The Abyss! There sure seem to be a whole lot of references to 33 in this page. Two sets of 33 in the ribbons; two pillars each with three sections in the middle. Okay, that’s not “a whole lot” but it’s something. Maybe it’s just more trefoil hints. Interesting! I just looked up the number 33′s significance in numerology, and it is referred to as a ‘master number’. The decroation on the pillars could be letters or numbers. The ribbons and ropes that go around the pillars look like 8s. The ribbon ends make 3s Es or Ms. The rope ends make Ss or ?s. Part of the guide riddle? Those aren’t just hands, they are “Gauntlets”. The Directions tell us we are being “challenged”. When you are challenged, the challenger “Lays down the Gauntlet”. Apparently our challenger has “laid down” his right Gauntlet so he has to point to where we are to proceed with his left gauntleted (bad form) hand. Challenge is mentioned 2 times in the Directions and again on the back cover, “MAZE will challenge you”. It was long ago observed that all the hands here are right hands except for the one in the top right corner; I’m not sure that a satisfactory conclusion has been drawn about why that is. It occurs to me that the one left hand points to the next page, and in that sense seems to be the one pointing the correct way. The first illustration of the odd-one-in principle? This is where I coined “odd-one-in” – remember “Which one of these is not like the other?” from Sesame Street? There would be four objects, the one I remember best was four sandwiches, all had different lunch meat but three had mustard and one had ketchup. This four hand arrangement on this page reminded me of that. While trying to think of a name for the Sesame Street game I hit on “odd-one-in.” Bit of useless history, but there it is.